Bookstores merchandise most books with the spine facing out. Only new releases and best-sellers get the front-face treatment. Merchandising books with the spine facing out allows the retailer to stock more books. However, front-facing books gives a book greater visibility and results in higher sales. 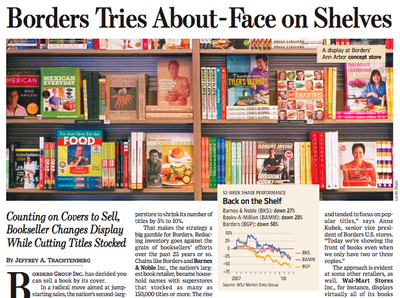 Borders recently tested a front-facing display strategy where more books were stocked with their covers, not spines, facing customers. Sales increased by 9.0%. The strategy was so successful, all Borders bookstores will be switching to the front-facing strategy in the next couple of weeks. The drawback to a front-facing strategy is Borders will have to reduce its inventory by 5%-10%. This means the typical Borders store will reduce its inventory anywhere from 4,700 books to 9,300 books. Execs at Borders aren’t too concerned about the loss of inventory since many of the books they stock only sell one copy per year. Bold move by Borders. We’ll have to see if this works in the short-term AND the long-term. FOR MORE: Read this Wall Street Journal article. FOR EVEN MORE: Seth Godin riffs on how Borders strategy is counter to the Long Tail. Joe Wikert, an executive at book publisher Wiley, fears customers will leave empty-handed because of the reduced inventory. I can totally get why people think Borders has more books. They see more book covers and that is usually the only remarkable or at least hopefully memorable part of most books. Good for Borders by living by the numbers and not old traditions. ...and good for Borders for testing, and not relying on assumptions! Think about it... This is the equivalent of a clothing store facing an outfit in front-view of the customer vs. only the side shoulder and sleeve showing. When I buy a book... I see the spine... I pull it out to look at the cover (totally judging it first by its cover) then if I'm still interested I flip through it to see if it is the kind of read I'm interested in. Display tables with stacks of books with their covers facing up get browsed because all of the covers peek up at you. And having an attractive cover becomes more important. What many people don't realize is that publishers (and even some authors) PAY to have their book displayed cover out on shelves. And those nice display stands you see at the font of the store? It's paid advertising. Call me a cynic, but might this strategy be a way to get more revenue from publishers in so-called "coop money"? So, under Borders' new merchandising strategy, how many books on average will be front facing vs. B&N? And, does anyone know how many bookstore customers are strictly mission focused, i.e., they will go in to get the book they know they want and ignore the rest (thereby making the pretty displays irrelevant)? If B&N adopted this strategy what would it's sales growth be, is Borders rocketing ahead or just achieving parity? As every greengrocer knows, you have to let the customers squeeze the fruit. Seth Godin thinks this runs counter to 'long tail' thinking, where more stock ought to sell more books. He's mistaken, because a retail bookstore, *however large it's inventory* is the very definition of the fat head. Even if you double the 'average' B&N of 150,000 books, you are still not competing with the inventory reach of Amazon, or any other large online seller, which is millions. People don't go into a chain bookstore expecting to be able to buy any book in the world, not until ubiquitous, instant print on demand arrives, at any rate (within 5 years is my guess). They come to see and feel the physical products, to get up close to them, to have a real shopping experience, to browse with the body in a way you just can't do online. This being the case, it's kind of obvious that the book's greatest attraction is its pretty cover (that and its smell of course). It stands to reason you'd sell more books cover-out. So your inventory goes down. So what? a 5-10% cut in a lot of books still leaves... a lot of books. Borders still has far more choice than a small independent. But then people also shop in a bookstore because they want their choice restricted for them - they want to know the store sells what everyone else is buying, plus a few interesting titles specially picked. In the gap between the small independent and the gargantuan Amazon, there's still a lot of room for manoeuvre. This will be pretty interesting to watch how it plays out on many fronts. How will Borders competitors react? How much will customers say it improves the overall in store experience? And how significant will the changes be to the relationships Borders has with publishers, authors and even online services now that it carries 10% less in stores? You have to admire them for taking this step though. I'm really glad to see that someone has tuned in to the experience and is actually studying ways to make it better. It's much needed. I used to work a small independent bookstore and I'd definitely say that we sold more books from displays and those books that had their cover turned out. If we made themed displays, those usually did very well. But I also wonder if the increase in sales was not solely from customers seeing "more" books but also from employee recommendations. I know that around inventory time I would “rediscover” some books that I had forgotten about. Not so long ago I found myself frequenting a couple of Borders locations near my work and home, and so decided to sign up for a Borders book card the next time I bought books. According to plan, when I next found myself at the checkout counter at a large book retailer (at a different location than those which I visited often), I inquired about signing up for a Borders book card. The saleswoman gave me a perplexed look. I asked again. That's when I noticed the logo on her nametag, and realized that I was in fact in a Barnes and Noble. Currently, these two chains look the same inside. Maybe this reworking will help Borders distinguish itself. Because I live near Ann Arbor, where Borders is headquartered, I was recently able to visit their new "concept store", which piloted this idea. My wife and I agreed that it seemed like a bookstore designed for people who don't like to read. We are heavy readers who own nearly a thousand books, and we won't be back in a Borders any time soon. I was just surfing the net and I have to say this is one of the most interesting blogs I´ve come across in a long time. Kind of refreshing to see a good quality blog with all the junk that is online these days. Just My 2 Cents. Enjoy!